HoA Laboratory, department of morning de-corpsification. Waking up is hard to do. It moves me from a pleasant, dreamlike state that is often quite interesting and/or relaxing than the average morning into the harsh, cold break of day. A day that often involves work, complaining, and possibly even sitting in an uncomfortable chair. My subconscious conspires to keep me in bed and as time goes by, I learn how to sleep through my alarm clock, or turn it off without sleeping. The snooze button is completely useless for me, as it just leads to me sleeping until noon in 15 minute increments. The solution was to force me to stay by my alarm clock (and out of bed) for a brief period of time. Long enough for me to come to my senses and start the day. After experimenting with different locations for the alarm clock, I modded it with a circuit that adds a button that stops the beeping when pressed down, but will start it up again if let up before a delay. To ensure the alarm gets me up in the first place, I wired the normal buzzer to a spare PC speaker with the volume cranked to maximum. The alarm clock of DOOM started when I was in collage the first time around. I've slept through a number of things in my life, including a fire alarm (the RA of the dorm had to shake me awake) and my house getting a new roof. The alarm of DOOM version 1.0, which I never took pictures of, lacked the delay mechanism but served well enough for the time. It eventually ran afoul of a roommate and never worked again. I had to be satisfied with someone kicking me out of bed to turn off my conventional alarm clock for awhile after that. A few years later, I took my first class in electronics. I learned about the 555 Timer, and endeavored to use this newfound knowledge to enhance my awakenings. The circuit is quite simple: a 555 rigged up as a one shot is hooked up to a relay. Holding down the button for approximately 45 seconds charges the capacitor, which triggers the 555 and trips the relay for a short period of time. The relay is hooked up to the switch that controls the alarm functionality, and triggers between "alarm" and "off". In plain English, to turn my alarm off, I have to hold the button down for the better part of a minute. The alarm is right next to a coffee machine on a timer, so to get up all I have to do is pour the coffee into a pre-prepared cup with sugar and creamer, pour the now chilled and chuggable brew down my throat, and curse loudly. To prevent obvious escapes, the switch for the snooze alarm was removed, and the physical switch on the board soon after that. Closeup of the switch off delay circuit. Main circuit board consists of a 555 hooked up as a one-shot and a transistor hooked up to a relay that controls the alarm. Secondary circuit (right side, behind wires) is another 555 set to blink a light every second when the alarm is disabled by remote. This was (more or less) my first real electronics project, and it really shows. 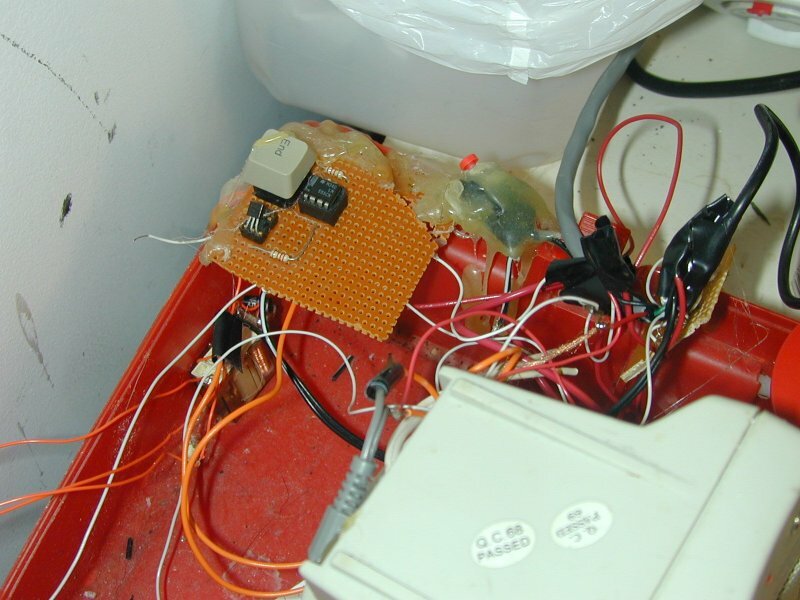 The wiring that is present in the picture was significantly cleaned up from the previous version, which says a lot. Ideas like altoids tin for circuit enclosures, using different colored wires and carefully running them, and electrical tape came with future projects. Eventually, the pesky subconscious figured another way out, by resetting the alarm, it could get some more sleep! It was time for another upgrade, so I broke out the soldering iron. The alarm needed to be impossible to change in the morning, but able to change on a day-to-day basis so I could move it ahead for days off and the like. A D-Sub E cable was perfect for the job, as there were four switches to rewire, with two leads each necessitating 8 connectors, and the DE-9 had one more than that available. It could probably have been done with five lines, assuming they shared a common ground, but it was faster to solder the extra four wires than figure out which was ground and if there was multiplexing. The programming cable can be removed and placed far away from where I can find it in my sleep, and still be easily plugged in to set the time and alarm. The old buttons were covered in a thick layer of hot melt glue (my favorite rapid construction medium) to prevent me from using them. Hot melt glue was also used to secure the circuits, switches and wires. The entire setup is placed in an old lunch box for easy transportation. The latest upgrade comes from my tendency to forget to disable the alarm when I spend a night away from the house. This has resulted in a few implied death threats from my housemates who can't seem to figure out how to deactivate it and are slightly scared of the mass of wires it has become over the years. To think, they believe that I'd build something that carried a lethal charge that I had to use in the morning. I ran a wire from my alarm to the outside of my room, and wired it so that they could turn it off without even stepping into my room or risking nonexistent death. The switch also causes a light to blink in my room (via another 555 circuit) to show when the alarm was switched off. The switch is mounted in an altoids tin affixed to a pole next to my house mate's bedroom door. I also added the Big Red Button at the same time. The BRB is a temporary addition as I have Plans for it in the future, but at the moment it adds a certain DOOM-y style to the alarm. External cutoff switch for alarm. The alarm clock is far from finished. Next comes a system that turns on all the lights in my room 10 minutes before the alarm goes off, followed by a system that adds a small display and a keypad that forces me to do math problems before the alarm is completely disabled, and administers a mild shock for every problem I get wrong. After that is an alarm that physically lifts my bed from the ground after I'm out of it to prevent me from going back to bed, a robot butler with a squirt gun, and a robot butler with a squirt gun and ninja skills to defend against my wakeup rage. 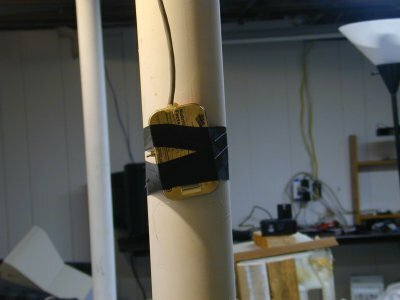 2002: Version 1.0: PC speaker upgrade, but no delay circuit. Was destroyed by roommate while at Lake Superior State. 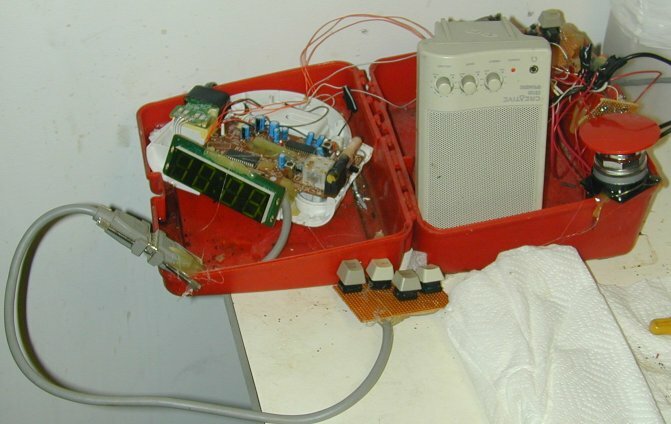 2005: Version 2.1: Coffee dumped on alarm clock. Circuit salvaged but alarm clock needed replaced. Lunch box case added at this time. 2007: Version 2.2: Removed interior buttons and replaced them with removable exterior programmer. 2008: Version 2.3: Added Big Red Button, external cutout.